Diseño de estratégias avanzadas de control y detección de fallos para sistemas mecatrónicos complejos. The main objective of this paper is to introduce an academic example on the use of histograms to develop a wind turbine blade fault (or damage) detection system. This approach merely uses data analysis obtained from a generated wind turbine power. Then, and based on the power curve of a wind turbine, histograms are obtained, first, for the healthy wind turbine operation, and then, for two cases on faulty wind turbine operations. By comparing them, a faulty behaviour of a wind turbine is detectable. Finally, according to our numerical example, the proposed technique seems a realistic case to students on the statistic and probability fields as a useful academic example. 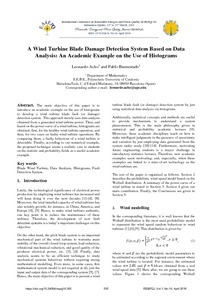 Acho, L., Buenestado, P. A wind turbine blade damage detection system based on data analysis: an academic example on the use of histograms. "Renewable Energy and Power Quality Journal", 11 Abril 2018, vol. 1, núm. 16, p. 505-509.